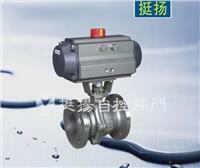 QJ (D / S) R-type O-intensive small pneumatic valve one kind of cut off the corner of 90 ° rotation of the controlled valve. It consists of pneumatic piston actuator and the composition of O-type ball valve, valve core sphere using cylindrical hole. QJ (D / S) R-type for soft seated ball valve, QJ (D / S) RY-type of seal valve. The product is compressed air as power source, accept the distributed control system (DCS), programmable logic controller (PLC) such as switching signals, can be realized through the solenoid valve control valve fast bits. The product is through casting body, spherical processed by special technology and hardened, making it a smooth surface wear, with a long life, compact structure, reliability, flow capacity, flow resistance coefficient is small, easy to install and good cut-off performance characteristics. Products are widely used in papermaking, petrochemical, metallurgy, aerospace, food, medicine, water treatment and other industries, particularly for high viscosity and contain fiber process control.